There are very few players as composed as Bojana Bobusic who is now preparing for Australian Open 2013, writes James Crabtree. There are very few players as composed as Bojana Bobusic. Whether she has won the point, lost it, botched a forehand or made a fantastic retrieval her body language and routine remain the same. She retreats to the back of the court, calmly checks her racquet and focuses on the next point. Apart from the occasional clenched fist, to guess the score would be a lottery. Regardless, the steadfast poker face remains the same. 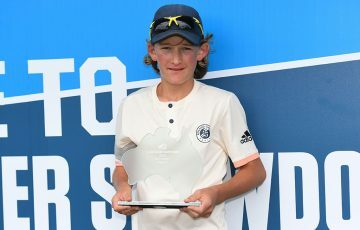 Not that there were many missed shots by the fifth seed from South Perth, who only lost one set en route to claiming a prized Australian Open wildcard. 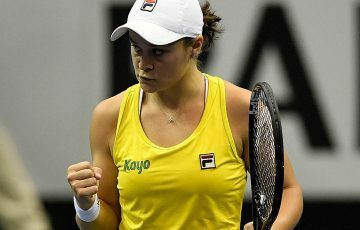 In fact, the emotional floodgates only opened after her opponent double faulted on match point, prompting Bobusic to raise her hands to the sky with a relieved smile across her face. Twenty-five-year-old Bobusic can most certainly pack a punch when needed. But in truth, her game is built upon unwavering consistency that has driven every opponent in her wake barmy. 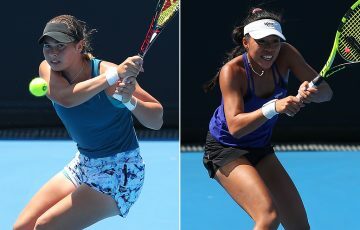 Count Storm Sanders, second seed and 2011 champion Ashleigh Barty, fourth seed Arina Rodionova and third-seeded finalist Monique Adamczak among the list of fallen rivals driven to distraction. Bobusic’s resilient and consistent style on court is a fair reflection of the woman off the court. 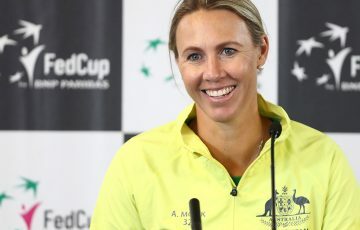 Her favourite read is Open, the revealing biography of baseline legend Andre Agassi, and the player she most admires is the tenacious, never quitting Aussie counterpunching hero Lleyton Hewitt. Like her heroes she is a baseline double-handed backhand player, a little undersized but willing to grind her opponent to dust. Her defensive skill set is her offensive weapon, a system that may have been ingrained in her from the start while playing catch-up to an older sibling. “I started [playing tennis] about six. My older brother played and I just followed suit trying to keep up.” Bobusic reflected. 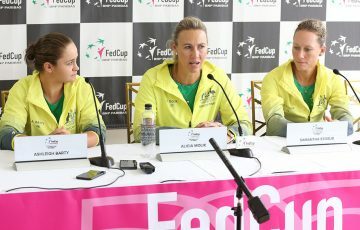 Bobusic talks devotedly of her close knit “tennis family”. Even still with the scheduling of the December Showdown and her own success, Bobusic was forced to miss her brother’s wedding because of her quarterfinal clash with Barty. Nonetheless her friends, and no doubt her computer engineer parents, helped her play catch-up via Skype calls to keep up with the proceedings. 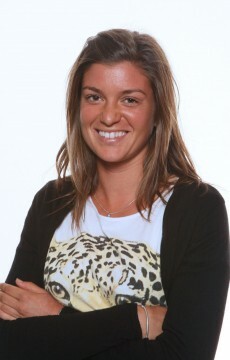 Bobusic, who was born in the Serbian capital of Belgrade, settled with her family in Perth when she was 11 months old. Since then tennis has taken her across the country and around the globe. She currently splits training time between the National Academy in Perth and with her coach Rohan Fisher at the National Academy in South Australia. She also had a four-year stint in the United States at The University of California, Berkeley. Studying on scholarship, she received a degree in sociology at a school that lies only a short distance from San Francisco. 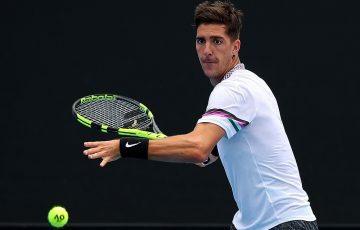 “Berkeley was a great four years but it’s always great being home,” said Bobusic, who is quick to rave about the sort of home cooked food you can’t get on tour, especially of the Serbian variety. Bobusic, a West Coast Eagles supporter, has most certainly earned the right to relax. But don’t think for a moment that this controlled baseline hitter will sit around, vegging out and resting on her laurels. 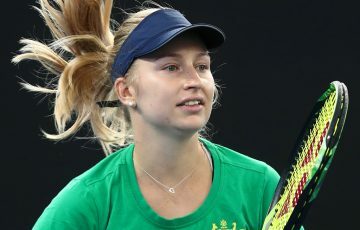 The current world No.334 baulked at the idea that all the hard graft has been done, explaining that simple perseverance is the key to her current form. “I try to just keep working hard and plugging away, keeping my same routines. I haven’t been doing anything special or fancy. Just taking every day as it is and repeating.